As musicians, these kinds of features sound familiar: “Four effects layers per channel	, larger clip bank, integrated MIDI templates, effects triggers, clip sequencer, easy-to-use LFOs, new effects and parameters.” Some kind of new sampler/synth, maybe? 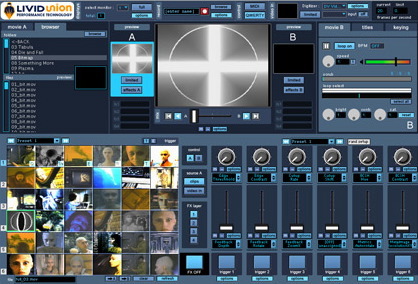 Actually, it’s the new features in the upgrade to the VJ app, Livid Union 1.5, for Mac OS X. Fortunately, unlike hardware “video synthesizers” like Edirol’s CG-8 ($5295 list), this will set you back less than the price of a car — more like US$299. Sounds good to me. Union features lots of MIDI control, so if you’re looking for a “performance VJ synth,” this could be a good option. Expect an all-out VJ app review soon; competition is getting fierce. PC users, fret not: Plenty of Windows-based apps, too, even though the VJ community does tend to tilt Mac. More soon.